Winter: Mon. – Fri. 7:00 a.m. – 3:30 p.m.
Summer: Mon. – Thurs. 6:30 a.m. – 5:00 p.m. The Road and Bridge Department is responsible for the maintenance and construction of the roadways, bridges and drainage structure assets sustained through the direct and indirect efforts of Yuma County. The mission of the Yuma County Road and Bridge Department is to maintain a safe quality transportation infrastructure for the citizens who not only live and work in Yuma County, but also for those that travel through Yuma County. The mission of the Yuma County Road and Bridge is to safely provide the best transportation system in Yuma County, utilizing the most value for every dollar spent in this department. To exemplify the expectations of Excellence, Integrity, Respect, and Success. Utility Notification Center of Colorado CALL BEFORE YOU DIG!! New road development requests are to be in writing. In August of each year, a notice is put in the papers asking for road improvement requests, which is to assist in planning the next year’s budget. Commissioners and/or road supervisor will make a sight inspection before a decision is made. If a new road is requested which is not on a section line, a survey will be required and paid for by the party requesting the road. Design of any road will be approved individually; depending on the type of soil, the anticipated traffic, and gross weight. All new roads require a 60-foot right-of-way. The property will be a dedicated easement or deeded to the county. All roads must meet approval before Yuma County will take over maintenance. The Yuma County Commissioners will give approval in writing. All new roads will have a minimum of 26 feet of driving surface. There will be a minimum of 4 inches of packed base on any new road, more if needed to accommodate weight of semi traffic, which can be up to a maximum of 12 inches of base. When dry material is used, it will be required to be watered as needed so that packing operations will be effective under the weight of trucks and equipment. There will be a top cover of approximately 2 inches of gravel, or equivalent material. The installation of culverts will be required where needed. The road must crown at an elevation of 3% to 4% grade. Road abandonment requests are to be in writing to the commissioners. If the commissioners consider the request justified, a public hearing will be held before the commissioners decide to close the road. The hearing notice must be advertised in the paper two weeks. With the commissioners’ approval, a notice will be placed in the paper requesting property owners to keep our roads safe. This is done in the spring. Sprinkling of roads: On the first report of water sprinkling the roads, the property owner or operator of the sprinkler should be notified through a call by the road and Bridge Department and the call documented. On a second report of the same party sprinkling the road, a letter of warning should be mailed to the owner or operator. When there is a third report on the same party at the same location, a citation will be given by the Sheriff’s Department. Dumping of appliances, trees or any solid waste in road right of ways. Using the roads as a turn around point at the end of farming rows. Farming with in 6 feet of the shoulder of the roads or to the bottom of the ditch. Whichever is the greater distance from the road shoulder. Fences constructed on or across county right-of-ways. If excessive road damage is done by a commercial business or individual (ex. Irrigation water, gas companies, or animal confinement businesses), the road damage will be evaluated; and the company causing the damage will be billed at 100% of what it costs the county to repair the road. Roads are maintained on an as need basis. High usage roads will be given first consideration. Lower usage roads will be maintained depending on weather conditions and available time. The county will not maintain private driveways. Special consideration will be given to individuals that require medical assistance. A county road will be improved to provide school buss access at the request of the school bus superintendent. This may require gravel and grading to provide an adequate turn around area. These will be maintained only when necessary. Private driveways for school buses will be handled case by case. The landowner has the choice of building and maintaining a fence at the outer edge of the right-of-way or installing a cattle guard if a new road is built on open range. The landowner pays for and installs the cement base according to county standards. The county provides the cattle guard, does the upkeep, and cleans out the pit. The county will not install an approach less than one half mile from another approach if the land is owned by the same person. Landowners or lessees may install approaches at their expense with the road supervisor’s approval. The landowner will pay for the culvert. The county will install culverts where necessary across roadways to maintain the natural flow of water. The Road and Bridge department should approve all approaches. $50.00 for boring under each dirt or gravel road. $1,000 for trenching across each dirt or gravel road. $500 will be refunded after six months, if there are no additional repairs needed on the road. Should additional repairs be done by the road department, the $500.00 deposit will be reduced by the cost of the repair. $100.00 per rod for laying any other type of pipeline or other usage in the County rightÂ­ of-way parallel to the road. This may be considered for approval under special circumstances only by the Board of County Commissioners. 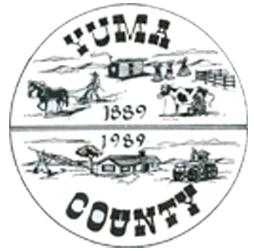 Special circumstances may cause additional fees, which will be considered on a case-by-case basis and approved by the Yuma County Commissioners. There may be a combination of the above fees, depending on the project. The Yuma County Road and Bridge Department will evaluate projects when the application is received. The applicant will be notified of the required fees. The fees are to be paid prior to the approval of the permit.